"Hey, didn't you say this cat food was for me?" 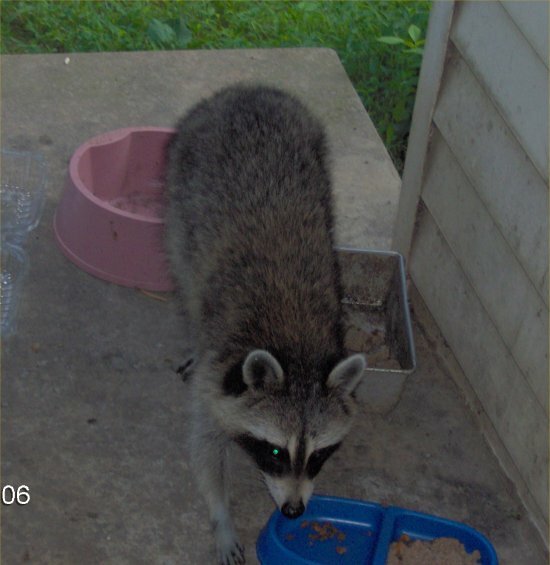 Here one of our raccoons comes to eat the cat food at 8 am in the morning on 8/1/06. 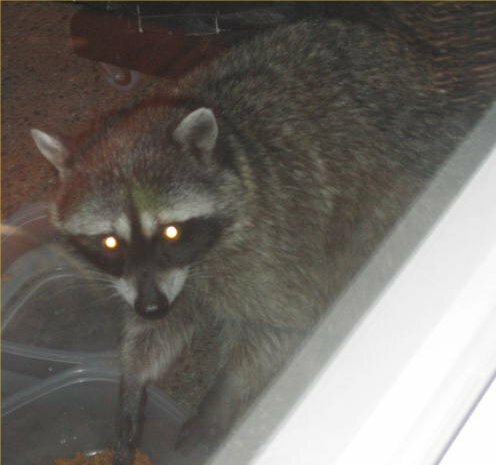 I opened the door to get that photo (no, I was not scared; rabid raccoons do not eat and would be aggressive but he was not). 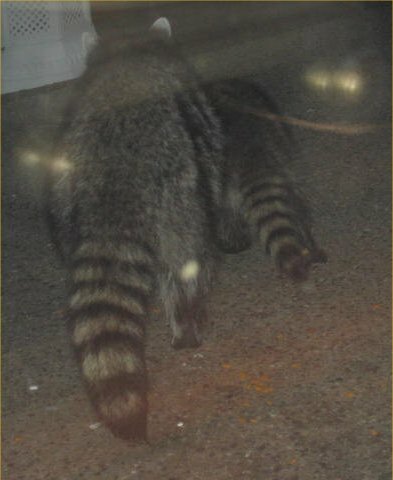 Here is another view of the same raccoon. 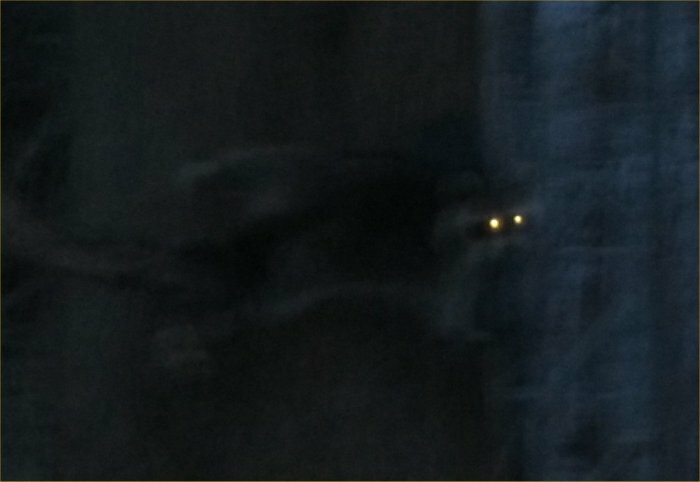 I also took three videos of the raccoon that can be seen below. 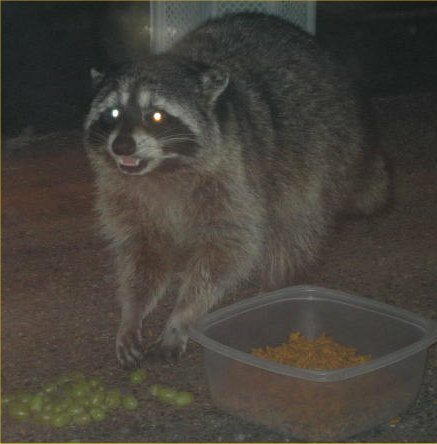 Raccoons love to eat fish. They love to create general havoc. 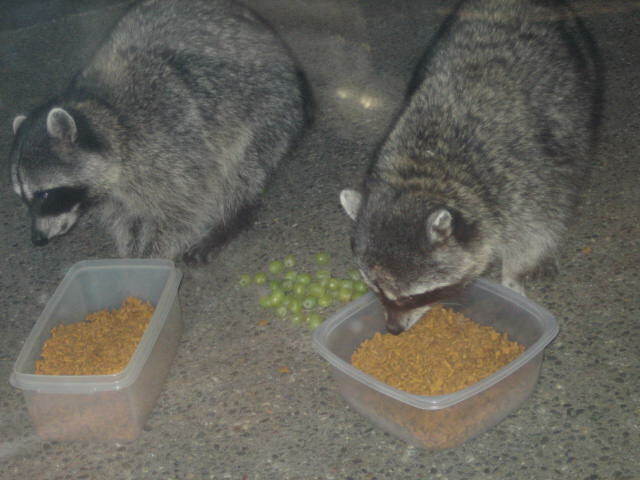 Our raccoons also love to kill snails and frogs and then not bother to eat them!! 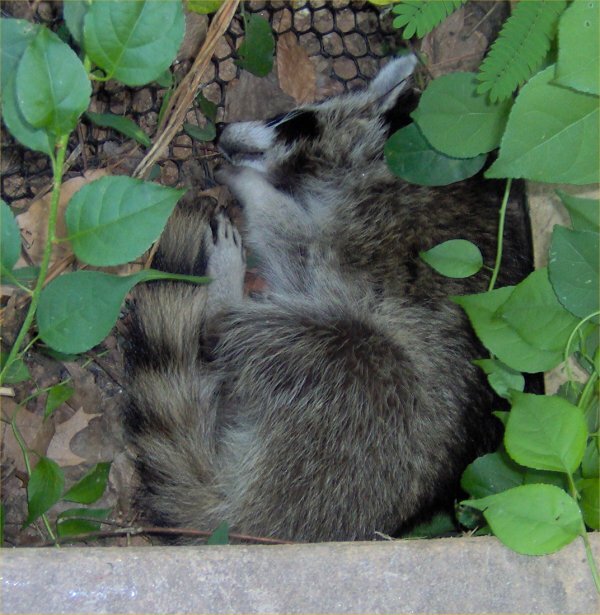 If you wake one morning to find plants knocked over and fish parts lying about, a raccoon may be the culprit. Raccoons like to be able to walk into the water. If the water is a drop off from the edge, they are less likely to get in the water. Ramps are open invitations. Cliffs and nets deter raccoons somewhat. Also, special contraptions that turn on lights or spray animals can be used to try to deter them from eating your fish. 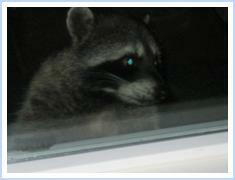 It is unfortunate that the sight of a raccoon generates fear because raccoons are a major carrier of rabies. Not all raccoons carry rabies. 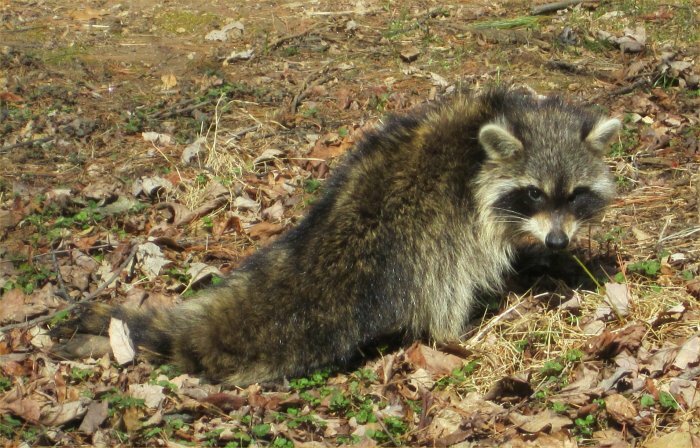 If the raccoon is out walking around in daylight or approaches people or pets instead of running away, then the raccoon could be rabid and would needs to be caught by animal control. 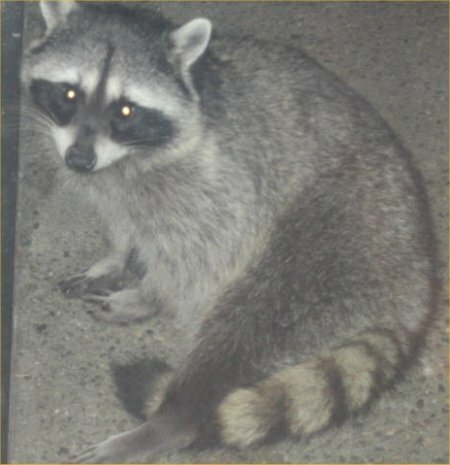 In addition to just being out in the daylight which some specific raccoons are known to do (and it is normal for them), a rabid raccoon will act confused, walk crooked or in circles, drool, and/or act very sick or aggressive. 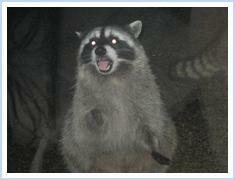 Otherwise, the raccoon probably is not rabid. 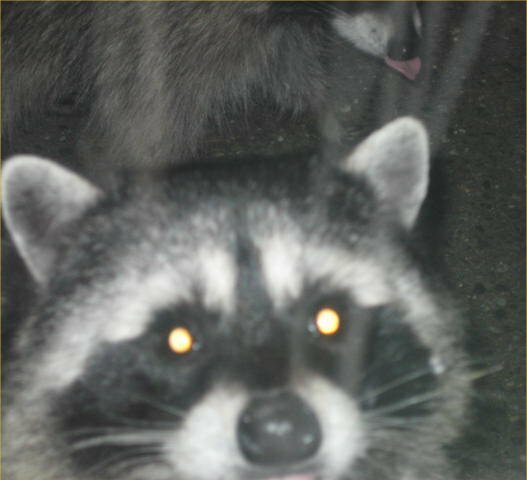 What with rabies and being killed by cars, it is amazing that raccoon populations have not plummeted. 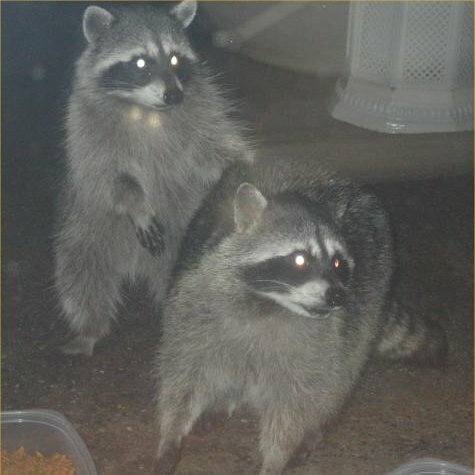 Our raccoons as they have gotten used to us have started to approach us slightly when we come out with food and come out before it is totally dark but they are very alert and act normally so it is no problem. 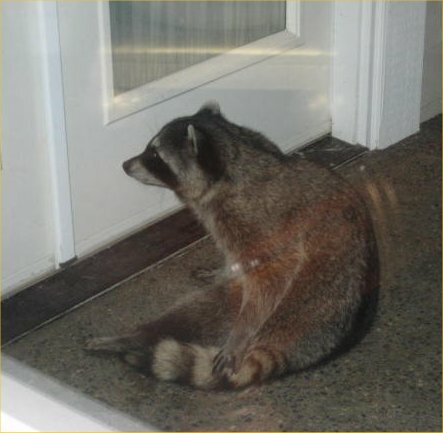 Years ago, I saw a raccoon out at mid-day, kind of zig-zagging and paying no attention to my car. That raccoon might have been rabid. Try not to live in fear, use common sense, and if you are ever bitten by any wild animal that could carry rabies, go to the hospital and get the shots just in case. 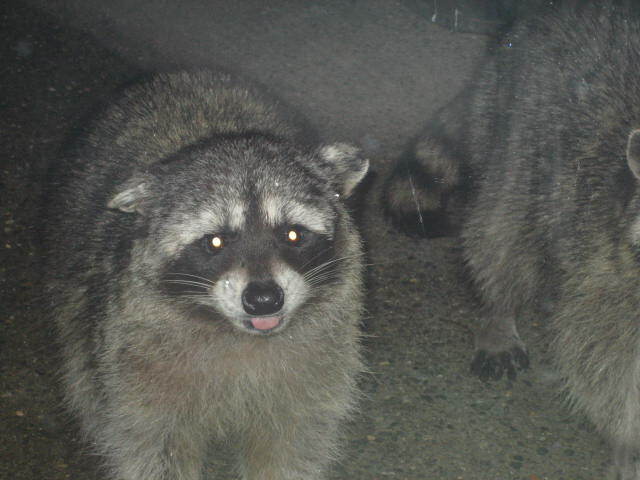 In my area, raccoons and foxes are the two most likely species to bite humans if rabid. 1. Eliminate shallow areas. Raccoons do not like to swim. 2. 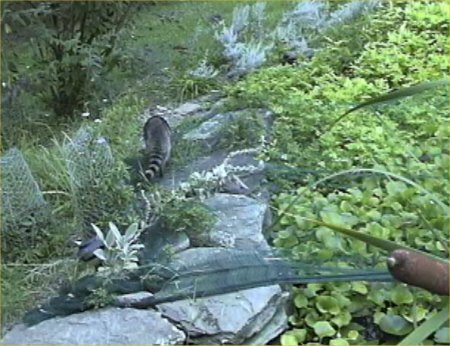 Eliminate areas where the raccoon can walk right into the water. They do not like to have to hop off a cliff to get into the water (but our raccoon does do it sometimes, at least into the shallow areas). 3. Add a "heron-scarer" which is a motion-sensing squirter attached to the garden hose. It will squirt anything that moves (including you!). 4. Put a pond net over the pond. 5. Add lots of hiding places for fish including many plants, overturned pots, PVC pipes, etc. 6. 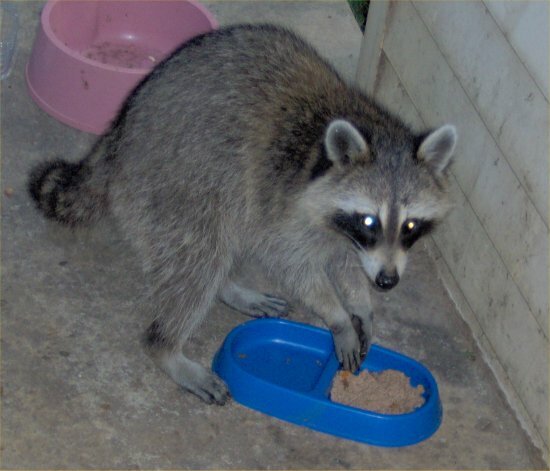 Add small expendable fish such as rosy red minnows to satiate the raccoon. 8. Find some really hot chili peppers. Coat them in peanut butter. Lay them around the pond. 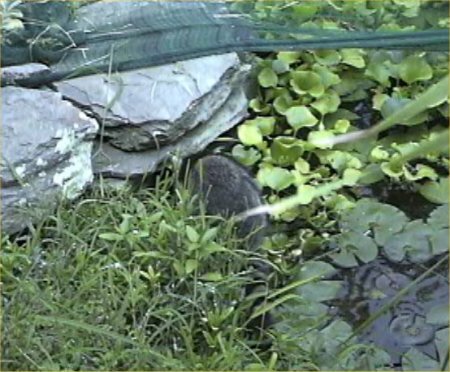 Raccoons and perhaps other animals may bite into them and decide that eating around your pond is nasty! 9. Fence in the pond. Traditional fences can be used or electric ones. 10. As a last resort, a nuisance raccoon can be trapped and moved. 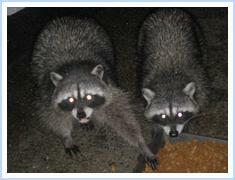 These items may help to deter raccoons. They are from left to right: a "deer scarer" (it makes noise every minute or so, not much of a deterrent), spray away (squirts water when it senses movement; raccoons might like that! ), koi kastle (basically an expensive fish hiding place; you can make a cheap one with milk crates or PVC pipe), and an electric fence for that ultimate protection. 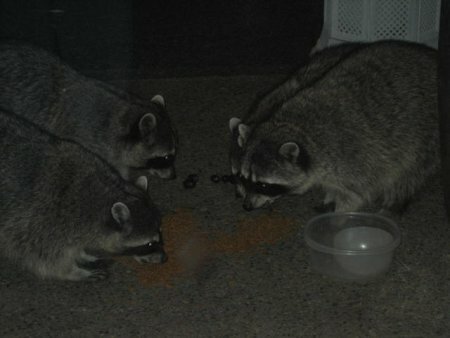 We have a few raccoons. They are always getting in to trouble. You can read about the things they have done in almost all of my pond newsletters. 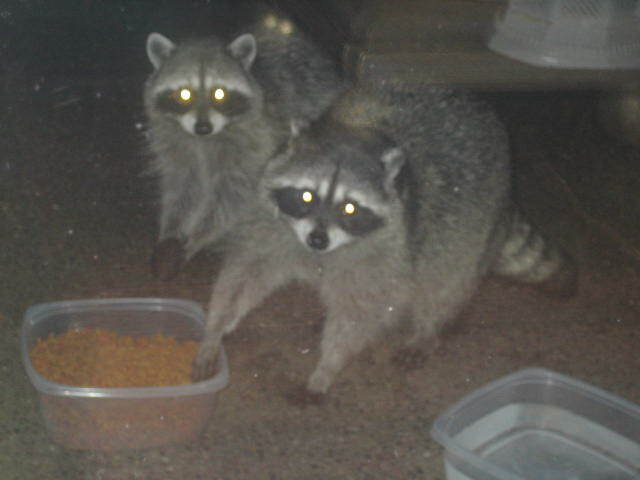 We have raccoons. They fought over any dead fish I tossed out of the pond into the woods in 1998 (a spawning die-off). They also broke into my wild turkey's pen by bending the wire and ate his food at night until we replaced the wire. Sometimes they scream which makes it impossible to sleep. I hear them and see their tracks and aftermath often. In my large pond, I sometimes find pots knocked over in the shallow end. No large fish have disappeared but if they had eaten a few dozen minnows I would never know since there are hundreds. I have seen raccoon tracks in my small totally wild (no fish) lined pond farthest from the house. 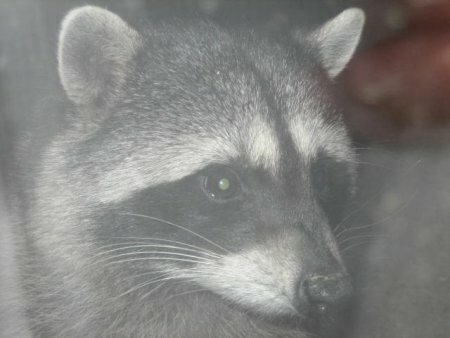 By 6/22/99, I had seen the raccoon myself on the back porch eating leftovers multiple times. 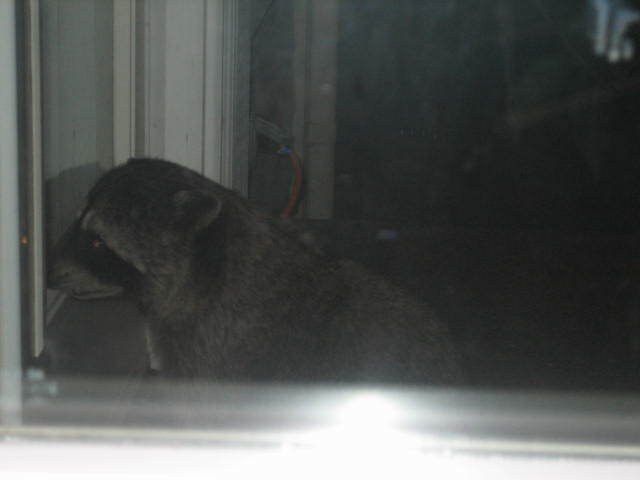 By 2000, he/she comes at least a few times a week to the porch after dark. His/her wobbling walk is quite funny. 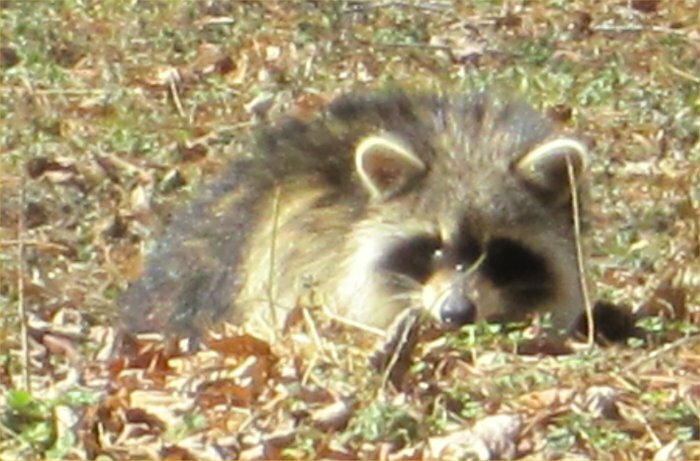 Unlike most people with raccoons, this one does not bother with my ponds so we tolerate his/her cute presence. I guess he/she is too full on leftover cat, dog, and people food to bother swimming around in the deep pond trying to catch fish. 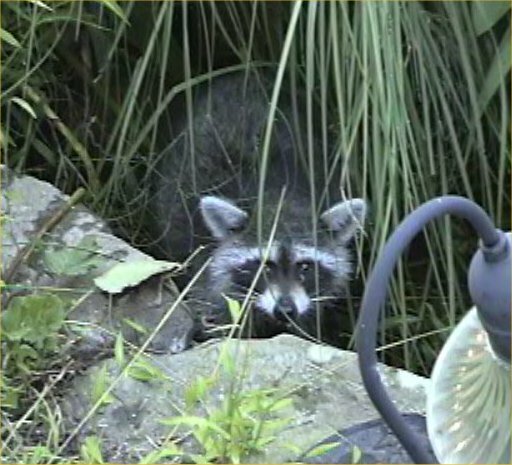 The raccoon occasionally knocks over pots in the pond but seems to be spending most of his/her trouble-making in destroying the "squirrel-proof" bird feeder and turning the hummingbird feeder upside down for a sugary drink. 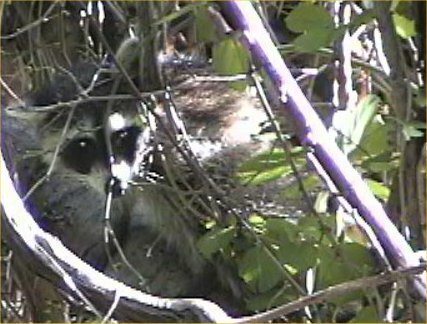 By 2001, the raccoon now roots around in my smaller ponds and eats snails, tadpoles, and green frogs, often pulling them out and leaving them to die without bothering to eat them. He/she also splashes a lot of water out of the smaller ponds. 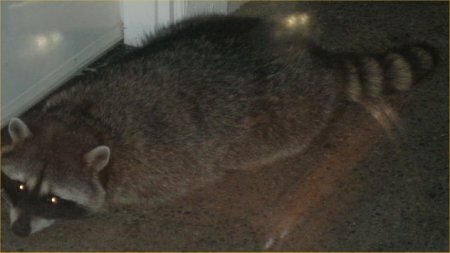 Photos of the raccoon are at the top of this page. 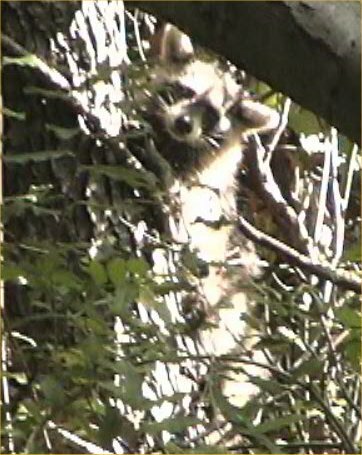 A sick baby raccoon hung around for a few days in August of 2008. He/she did not seem to have rabies (no foaming or aggression and a very good appetite) but was very weak. 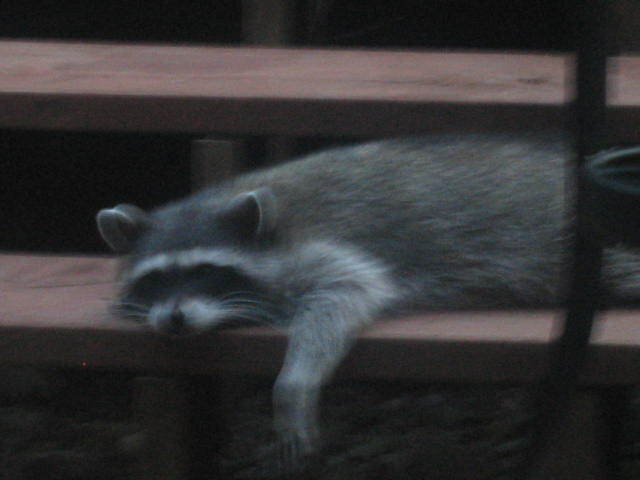 The day of 8/17/08, he/she spent the day sleeping at the edge of the back porch. I took this photo of him/her sound asleep. That night, he/she left never to be seen again. I found this raccoon climbing our oak tree to eat from the squirrel feeder at dawn on 3/2/15. Sorry, you cannot really see much except flowing eyes! 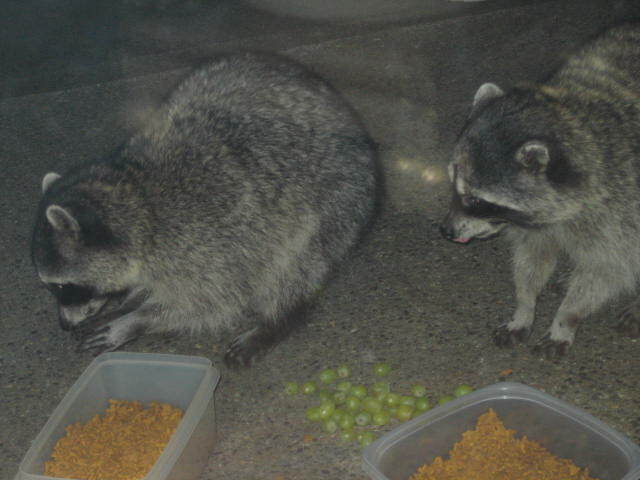 An injured raccoon appeared in early April, 2015 and was around for a few days. It looked like he/she was run over by a car and was paralyzed. I named him/her Angel. 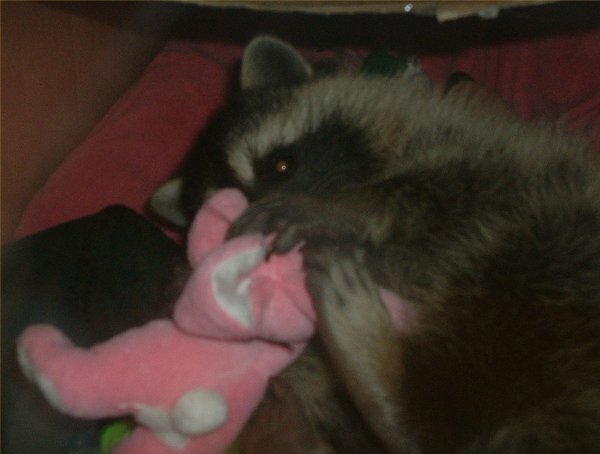 I could do nothing as any and all agencies that might have come for the raccoon would only have killed him/her. Despite his/her injuries he/she could move at quite a clip. 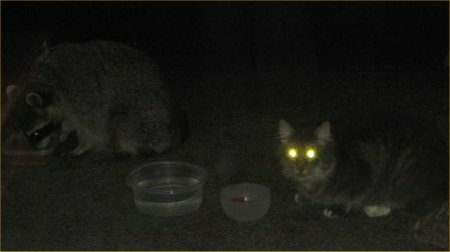 I provided some cat food. 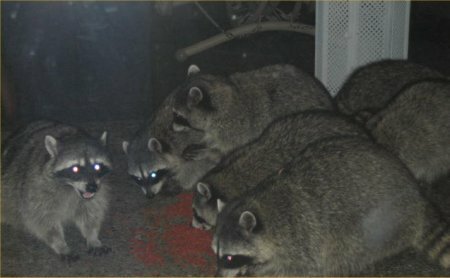 These are photos of raccoons that other people have sent me listed from oldest to newest. 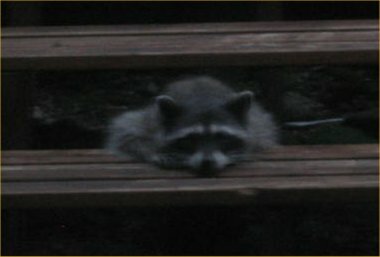 On 10/18/05 and 10/19/05, Cecilia sent me some photos of the raccoons that have come to feed on her porch in Washington state. Here are some photos! Cecilia sent some more photos of raccoons on 6/13/06. Cecilia sent even more photos on 1/10/07. 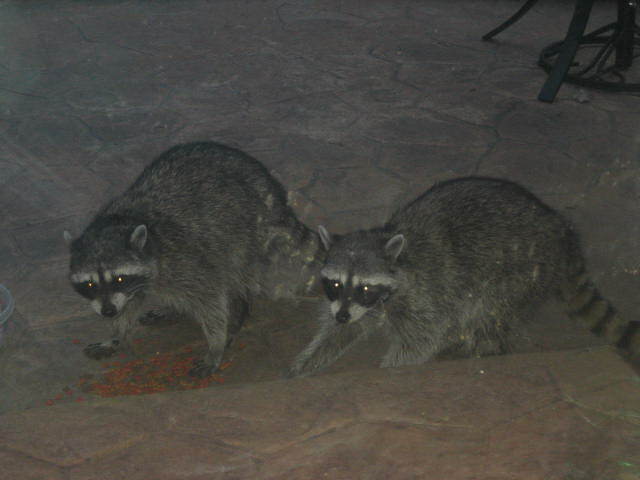 Two raccoons - "If I just take one, the cat won't notice!" 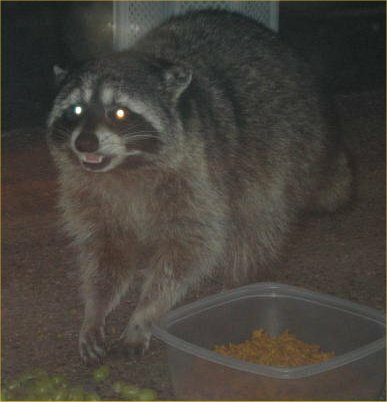 "I have attached a couple of pics of my raccoon I've named her Precious - for some reason she really likes to have her photo taken. I know that she is a little girl because she loves to sleep on her back. We put out a large box with a couple of blankets in it, and I've put a stuffed little bunny in there that she loves, and a plastic 'my little pony,' (of my daughter's) with green hair that she likes too. She usually is in her box when I go up to bed and put their food out and the latest that I've seen her still in her box was at 4:30 a.m.; I woke up and looked out and she was still there asleep. I was taking these pics from inside the bedroom, and, of course, she was outside on our porch (in her box). She let me take about 50 photos of her that night. Isn't she something? She is very sweet, and, for some reason, she just adopted me. 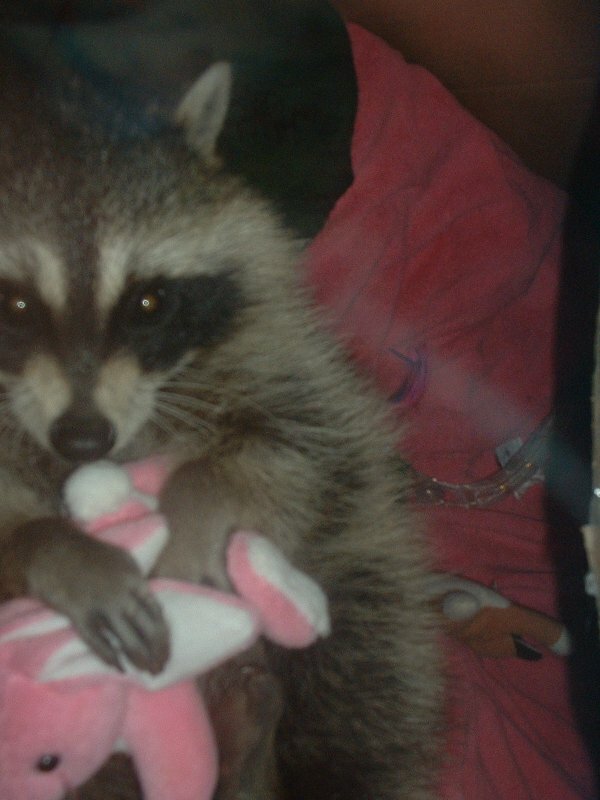 What an honor it is to be adopted by a raccoon I'll never forget her. I don't know what's going to happen when it's no longer cold. Will she leave, will she stay? So many questions I hope she stays but she'll grow up at some point and leave, don't you think?" 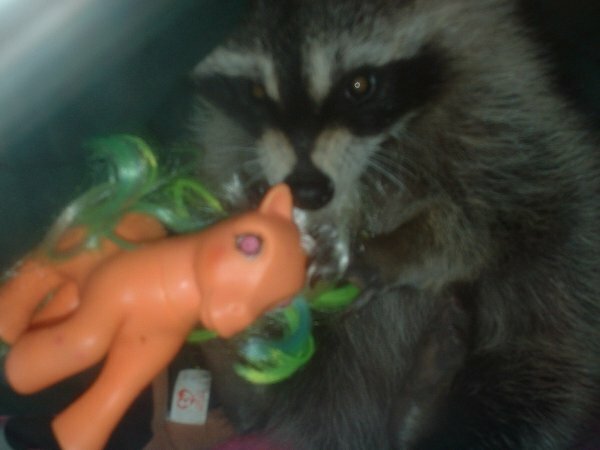 Raccoon with "My Little Pony"
Cecilia sent some more photos of raccoons on 9/29/08. 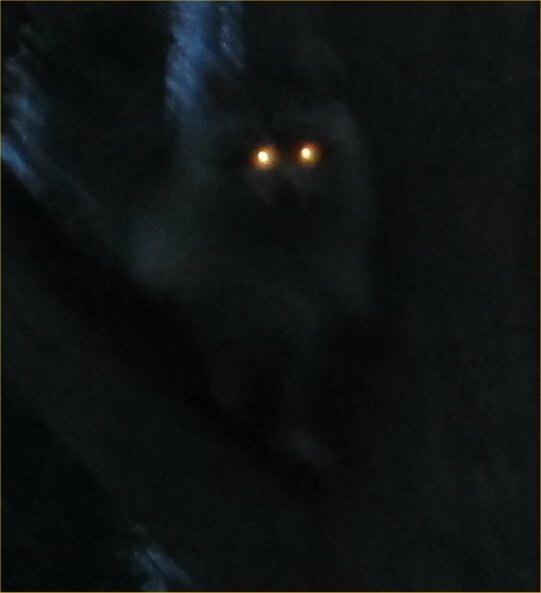 Raccoon - she calls him "George Coonie"